Size: 918 sq.ft. - 2030 sq.ft. The Beaumonte is very ideal structure and is among the on-going projects of Sheth Developers & Sahana Group of companies in Sion Circle. Sheth Beaumonte is a residential development of 2.6 acres having 3 high rise towers constructed in a way that every corner of the buildings allow ample amount of air and light into your house. It is capable to give 480+ duplex apartments. Each of the tower containing 50+ storeys with the marvelous views of Arabian Sea and other external views. The Beaumonte offering very suitably priced apartments that start from 3.68 Crores onwards and possession is anticipated by 2022. The Beaumonte is crafted with multi storied towers provide you ultimate choice of 2 BHK, 3 BHK & 4 BHK unit sizes with strong attention to detail. It is compromising carpet area of 1520 sq. ft. to 1650 sq. ft. for 2 Bed units, 1590 sq. ft. to 2705 sq. ft. for 3 Bed homes and 2693 sq. ft. to 3480 sq. ft. area for 4 BHK flats. The structure of the towers starts with 2 basement levels above that there is Ground floor. The interior of the Beaumonte apartments are featured with Vitrified Tiles Flooring, Concealed Wiring, Modular Electrical Switches, Anti-Skid Tiles, Granite Kitchen Counter Top and Decorative Doors in each rooms and bathrooms. Over ground floor it will be having 5 podium levels and on 6th floor you enter to an Eco-Deck while the rest 45 floors are dedicated to residential surface. Sheth Creators got incorporated in the year 2000. They have undertaken approx 100 projects till date all over India and overseas. The group has earned great achievements in a short period of time. About 20 million square feet projects are developed by them which contains all kind of properties like township projects, residential projects, mixed use projects and commercial projects. The group’s first success began when they came in collaboration with Sahana group of companies. Sheth Developers has built more than 18000 units of different sizes. Sheth Creators choose locations for their developments that push more values & get recognition towards their growth like Andheri, Sion, Bandra & Malad. The quality of construction, timely execution of the innovative projects, professionally managed team and modern architectures have made them the winner of 33 Awards and also an ISO Certified real-estate company. This under construction project lies at Central line of Mumbai at Sion East. Central area of Mumbai is mostly preferred as housing locality. It is in the vicinity from Lalbagh Flyover. Sion east has welcomed many residential towers and already in demand by end users & investors. 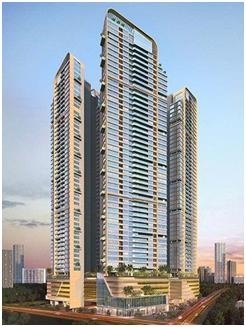 Sheth Beaumonte is well connected to several areas like Thane, Mulund, Bhandup, Kanjurmarg, Ghatkopar as well as harbour and western parts of Mumbai. In today’s date Sion East is one of the busy locations by introducing various projects, education institutions and is already praise by our Mumbai’s popular developers. Sheth Beaumonte is located near Sion (East) railway station at Namdev Koli Marg, Mumbai, Maharashtra – 400022. There are several benefits and amenities on offer for The Sheth Beaumonte’s residents including Outdoor Tennis Court, Private Terrace & Garden, Dance Studio, Power Back Up, Club House, Cafeteria, Bar, Jogging Track, Swimming Pool, Lift, Service & Goods Lift, Visitor Parking, RO Water System, Water Storage, Amphitheatre, Air Conditioned, Intercom Facility, Maintenance Staff, Gym, Flower Gardens, Security, Park, Multipurpose Courts, Activity Deck, Event Space, Reserved Parking, Piped Gas & Rain Water Harvesting etc..
Schools - Dhirubhai Ambani International School, American School of Bombay, SIES High School. Colleges - KJ Somaiya College of Engineering, Trinity High School, Padmabhushan Vasantdada Patil Pratishthan’s College of Engineering. Shopping Malls - Chroma Mall, High Street Phoenix, Atria - The Millenium Mall, High Street Phoenix, RM Shopping Centre. Hospitals - Pikale Hospital, Lilavati Hospital & search Centre, Hinduja Hospital,Tarachand Bapa Hospital. Bank/ATM(s) - State Bank of India, Kotak Mahindra Bank, Dena Bank, HDFC Bank, Syndicate Bank, Canara Bank. Other recreational places - Dadar Beach, Snow World, Gateway of India, Dadar Club, Shivaji Park, Kala Ghoda. 918 sq.ft. - 2030 sq.ft.